Given away free in a jewel case with German magazine "RockHard" issue Vol. 293, October 2011. 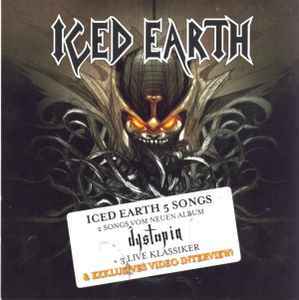 Information on cover and CD: Iced Earth 5 Songs: 2 Songs vom neuen Album "dystopia" + 3 Live Klassiker & Exklusives Video Interview. Tracks #1, 2 taken from the upcoming Album "Dystopia". Release date (VÖ): 14. Oktober, 2011. Recorded, mixed and mastered at Morrisound Studios in Tampa, Florida during the months of July and August, 2011. Tracks #3 to 5 taken from DVD "Festivals Of The Wicked"